A great drill for both forwards and defenseman. Works on playing situations in tight areas, pucks on the wall, 2v1 out of the corner for both sides. The first scenario (on top) a coach will throw a puck in along the wall, and the 2v1 plays out from there. 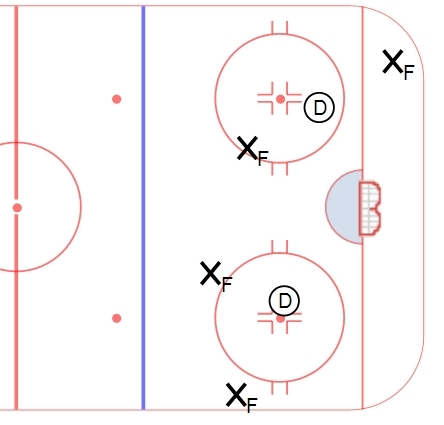 In the second scenario (on bottom) a coach will give a puck to either forward and the 2v1 plays out afterwards. While the drill is very simple in construction, the teaching points and the nuances are important. D should try to split their vision, understanding the spacing and where to position their body and their stick. Forwards should try to attack open ice, creating a quality scoring opportunity in the situation. Speed, vision, awareness, and poise are all important in this drill. Communication between the forwards as well as between the D and the Goalie is critical as well. Both scenarios can be run through in small groups, with a coach taking half the team in one end and another coach taking half the team in the other. It is also good to run them out of both sides of the ice, so players get comfortable on both sides.